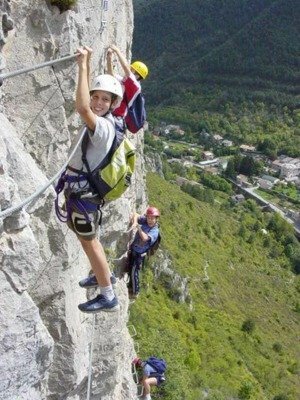 Discover an amazing range of via ferrata on this guided via ferrata holiday in the South of France. This holiday takes place in the spring and autumn an ideal time to visit as it is not too hot and there are less visitors. Where are the via ferrata? 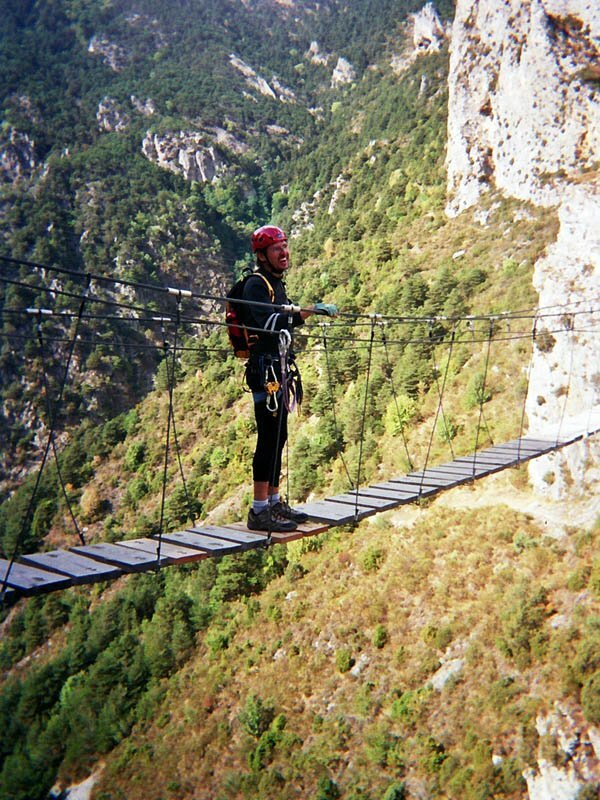 The majority of the via ferrata are in the Alpes Maritimes within the Provence-Alpes-Cote d’Azur region. Close to the Mediterranean and the Italian border the area is renowned for good weather. There are an average of 300 days of sunshine a year. The via ferrata are located in very contrasting locations. Some are close to the summits others down in deep river valleys. There’s a range of grades some quite challenging. Some of the via ferrata are divided into sections. This makes it possible to either complete the route in its entirety or “escape” earlier. The village of Lantosque, dates from the 12th century and is situated on a promontory between the rivers of the Riou and the Vesubie. The via ferrata here wends its way in the river gorge of the river Vesubie. Peille is one of the many medieval villages on the Cote d’Azur. Old streets with arched passages maintain the medieval character along with well-worn cobbles. Currently the via ferrata here has been closed by the local council. The Mercantour National Park is home to a couple of amazing via ferrata that finish high in the mountains. We will move accommodation most nights as the via ferrata are too spread out to have a single base. Saturday – meet at Nice Airport. Transfer to first night’s accommodation. Sunday – The via ferrata “L’Escale” is located close to the medieval village of Peille in the “arriere pays Nicois”. There are superb views of the village from the via ferrata. The via ferrata itself is quite athletic. Transfer to Tende. Monday – Via ferrata “des Comtes Lascaris” and, possibly, the via ferrata “de la Ciappea”. The counts Lascaris were the medieval lords of the region. 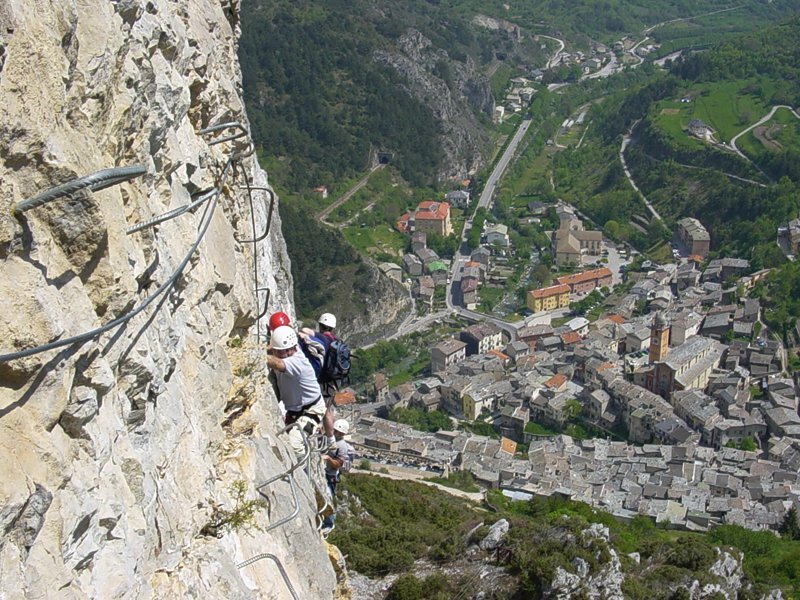 Close to Italy the little village of Tende hosts a via ferrata on the crest of the Saint-Sauveur ridge. 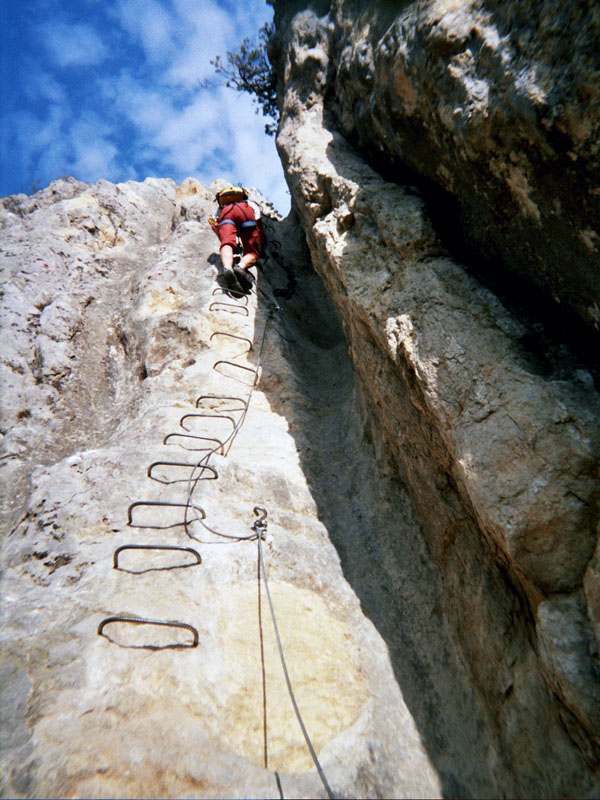 The second potential via ferrata called “La Ciappea” has a tyrolian traverse of 120m that requires a pulley. Tuesday – Today we have a gentler day near the village of Lantosque. The via ferrata of the Gorges de la Vesubie follows the line of the gorge criss-crossing the river by a series of “monkey bridges” and bridges. The via ferrata of “La Roche Suspendue” finishes in the village. Wednesday – Via Ferrata du Baus de la Fema. This via ferrata is 1600m long if all sections are completed! The via ferrata starts near the village of Colmiane and tops out at 2246m at the top of the Baus de la Frema. 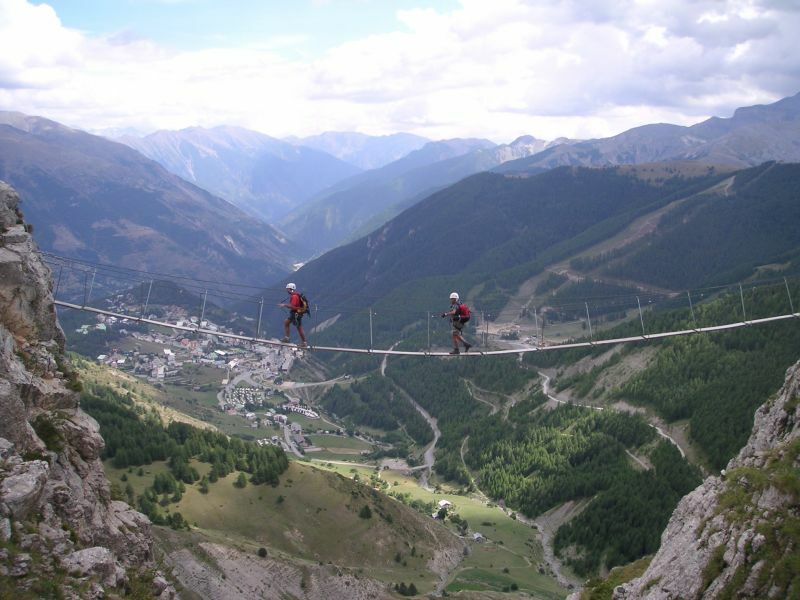 Thursday – via ferrata near the village of Auron. Today the via ferrata “La Traditionnelle” situated in the Parc National du Mercantour follows the line of cliffs culminating at the summit of the Bercha. The via ferrata is in 7 sections that can be all linked together or taken in a more pick and mix manner. Some of the sections can be quite athletic. Saturday – transfer to Nice airport after breakfast. Duration: 6 days guided via ferrata / 7 nights. Private group departures at your convenience, please contact me. Rating: Via Ferrata – a range of difficulties. Technical equipment: climbing harness, helmet, via ferrata set.